Kerry Wilcox makes many of the items in his store by hand. The Belle Fourche, South Dakota leatherworker caters to all sorts of tastes, from cowboy to truck drivers and bikers. Saturday, Nov. 29, the day after Black Friday, has become known as Small Business Saturday. The focus is on supporting the small businesses that directly benefit our communities. Leading up to Christmas, we'll be featuring small businesses that offer great gifts. To suggest a business that you think fits the bill, call us or post on our Facebook page. Kerry Wilcox always wanted to live "out West," and now he does. He spends his days building and fixing the leather equipment that goes along with the lifestyle. Wilcox and his wife, Bernadette Peterson, moved to Belle Fourche, S.D. from Wisconsin a year and a half ago and are now busy making and selling custom and ready-made tack, leather accessories and gift items from their store, Double T Leather. With 30 years of experience, Wilcox says there's not much he can't build or fix. He started out doing leatherwork in 4-H, then n the 1980s he started getting into buckskinning and pre-1830s re-enacting. 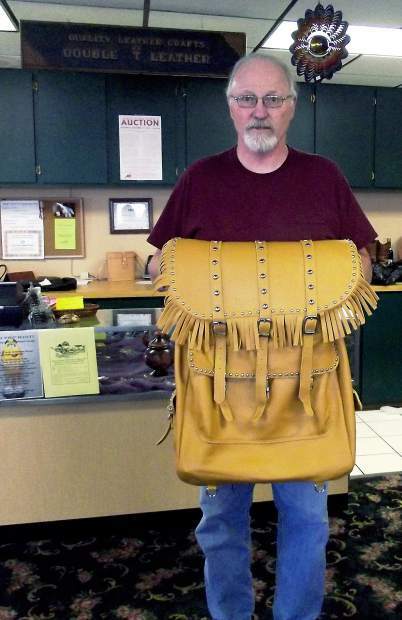 Since he was broke, he started making his own leather accessories, like knife sheaths and shooting pouches. Others liked his work and started asking him to do leatherwork for them, and the business grew from there. Several years ago he took a class on saddle building, more so he knew how to fix them properly than because he wanted to build them. Peterson makes rope baskets, vases and lamps. The two run the store with the help of one part-time employee. If you're shopping or ordering for someone else, Wilcox suggests doing some research before you come in. If you are looking at a belt, for example, it's best to bring in a belt the recipient currently wears–not one from the back of the closet–or to check the waist size on a pair of jeans. Though Christmas is still nearly two months away, Wilcox suggests getting in line if custom leather goods are on your shopping list this year. Right now he's scheduled for about three weeks out, so Christmas orders need to be in soon. Wilcox said items that have been popular lately include plain leather belts that can be custom-built in about an hour, and western-cut leather vests, briefcases, leather suspenders and tri-fold wallets. Their store is across from the Shopko parking lot, on the south end of the Conoco truck stop. They are open from 9 a.m. to 6 p.m. Monday through Saturday.